My name is Fenja, I am 24 years old and have my roots in Germany. In the meantime though, my heart got stuck in a different place, and that’s right here, in the breathtaking South Chilcotin Mountains. After finishing my apprenticeship for Graphic Design, I looked for something more challenging, something meaningful. 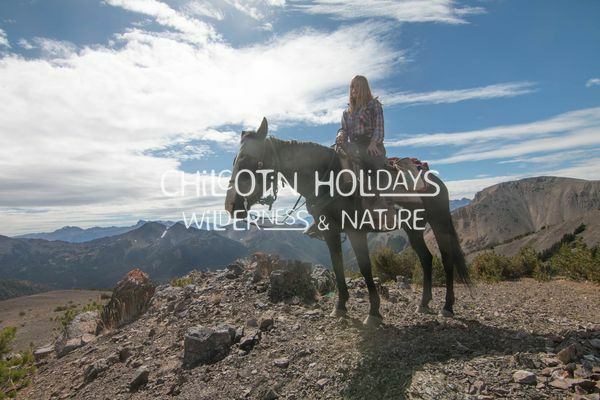 Looking for ranch work in the northern US, I ended up finding Chilcotin Holidays online. I read about their Philosophy, their environmental engagement and work ethic and I had an good feeling to apply for a 6 months internship. Fortunately I got a quick reply; with a load of paperwork to fill out. It took me a while to fill out the two questionnaires, but already then I had to be true to myself and reflect on me, which is an important part of personal development. I booked my flight for the 12th of July and was more than ready for a change in my life! My arrival at the ranch brought many challenges for me. I had to give a hand right away with sorting in the groceries, not having a clue what to do, overwhelmed by all the new impressions. Everyone of the team welcomed me warm hearted and I felt integrated in the group quickly. Generally speaking, we had a great team spirit! Continuing my first day, I had to do a lot of paperwork again, but as I realized I do it for me, and only for me, I worked my way through. Then, the real challenge began. I had to sleep in a tent for the first time of my life. Without my cozy pillows and fluffy blankets. Without my personal items (as my luggage got lost for almost a week), friends and my private space. I wasn’t used to sharing my shower with 18 other people. Eating in a big group, without deciding what exactly I want to eat was a tough one too. And then the work. Second day, being in the kitchen and cooking for 30 people. I was almost as nervous as I was when writing my final exams. Being responsible for something “big´” like this was what I was afraid of. Responsibility was a word of fear for me. It continued with moving the sprinklers (I was afraid all the grass would be dried out after I was in Ranch Hand), cleaning the rooms, and then working in the office and managing enquiries and bookings. I was glad I had a lovely team that was pacient and gave me room for mistakes. I was so afraid to do something wrong at first, I dreamed about enquires at night. Here I learned that success comes from experience and experience comes from failure. It’s okay to make mistakes, but it’s important to learn your lesson and do it different the next time. And if you failed because of a mistake in a procedure, you improve it to pass on your experience to future staff. I experienced quiet a few failures, but there is a lot I gained from it and most importantly, I am not afraid of it anymore. During my first two weeks at the ranch I wanted to go back home. Everything felt like climbing a mountain without getting anywhere. I didn’t see my progress or development, I just felt stupid knowing nothing about how life at the ranch works. Now I know that this is a process everyone goes through. Only when you’re willing to learn, are mentally ready and keep on working your way through all the challenges, you will succeed and suddenly everything seems to be easy. To quote Kevan: “ You can lead a horse to water, but you can’t make him drink” means there are countless opportunities given at the ranch, all you have to do is to take initiative and jump on them. If I wouldn’t have wanted to take responsibilities, I would have never ended up as the office and kitchen manager during my stay. These positions were a big step for me, as I was responsible for managing our bookings from enquiries to contracts and payments. If I messed up the inventory and grocery order, we wouldn’t have been able to cook for us and our guests. If I didn’t check the schedules, people wouldn’t have been picked up in Vancouver or arrived in an undone room. Now, I’m paying attention to details and big picture aspects more than ever, which I can not only apply to my work duties, but also to manage my private life. Talking about big steps, my biggest fear was that I would “have” to guide one day. With our Multi-Day Pack trips that we offer, we need experienced and reliable guides that lead our guests in the wilderness of the South Chilcotin Mountains. I was so focused on improving my office management skills, that I didn’t want to get distracted by anything else. I knew deep in my heart, once I started seeing the incredible beauty of my surrounding from the top of the mountains, I would get addicted. And so shall it be. After preparing myself by learning all the knots, safety rules, correct saddling and packing, I was ready for my first Pack Trip as assistant Guide. I was determined to do a good job and my guests, an amazing German family of 6, made it easy with their passion and participation in our program. I enjoyed every minute of this trip, from helping the kids bonding with their horses, taking care of them on the journey in the mountains, to sharing breathtaking 360 degree views on top of the world with them. Seeing this paradise of untouched nature felt like heaven. I developed a strong desire to protect this beauty and ever since, I found my purpose in nature and wildlife conservation. My studies in Germany will shift from Business Management to Environmental and Sustainability Management. Next to these great experiences, I was given the opportunities to shoot a gun, drive a tractor, I saw a Grizzly mum with her 3 cubs, spotted Marmots and Bighorn Sheep, visited a traditional first nation “pow wow”, learned how to start a fire, ran a chainsaw, experienced that fresh creek water is the best thing on earth and managed to vet horses in critical situations. These days it’s time for me to leave the ranch for jumping into my next adventure: Volunteering on an Eco Guest Ranch in Mexico, learning about their conservation efforts, self-sustainable existence, natural horse training and communicating all these things to visiting guests. I am determined to pass on the knowledge and experiences I gained the last months to have a positive impact on the planet we live on. One person alone might not be able to change the world, but starting by yourself you can be an inspiration for everybody else. I’m leaving the ranch with a feeling of accomplishment and desire to realize my dreams. One day, I will have my own self-sustainable ranch with adopted Mustangs and Burros, given the new purpose of helping people to find theirs, maybe in making this world a better place. For now, I keep working towards my goals and look forward to return to the ranch for another season next year.